It's raining. Again. I know...I'll be so glad the lakes are full and we are out of the drought this summer, but right now, I'm DONE with the rain. It just makes me long for summer. Speaking of lakes...I thought I'd throw-back to summer time at Shasta Lake. I haven't posted much about Shasta Lake yet. Mostly because we generally use Whiskeytown Lake more in the summer, due to our close proximity to it. But we have spent some considerable time on Shasta Lake throughout the years. For many years, we spent a week in the summer with my parents on their houseboat at Shasta Lake. It was so fun! We swam, used paddle boats, went tubing and water skiing, played games and ate great food. In the beginning it FREAKED ME OUT to have little kids on a house boat 24/7. Maybe you've thought the same thing and it's been keeping you from taking your family on a houseboat vacation. 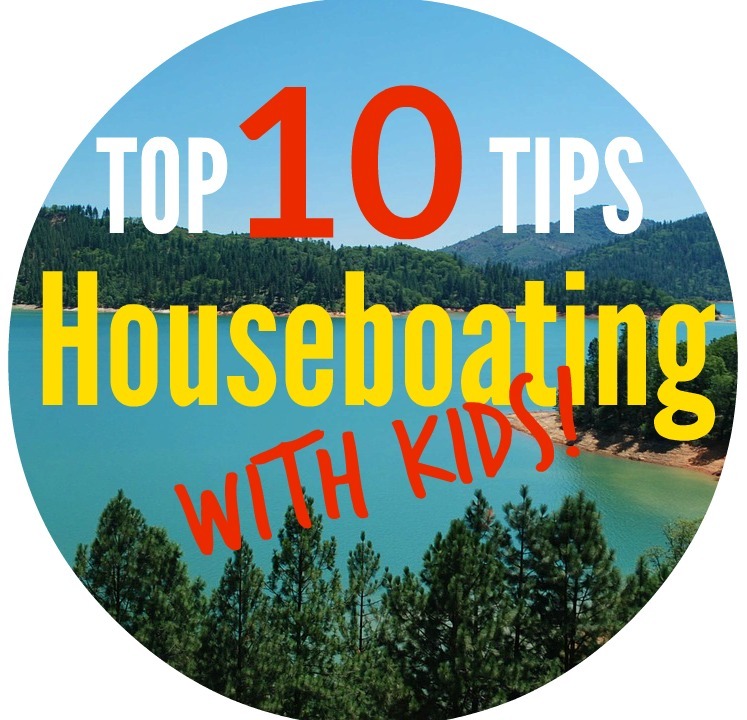 I thought I'd give some tips on how we took 7 kids (3 mine, 4 my brother's) ages 10 and under on a houseboat every year. 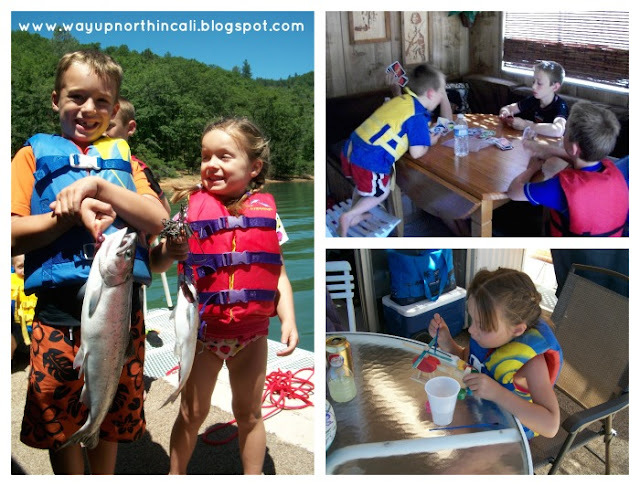 TOP 10 TIPS FOR HOUSEBOATING WITH KIDS! 1. RULES. Tell all children (and adults) what the rules of the boat are BEFORE they step foot on the boat. If the rules are explained up front, then there is less confusion and less accidents. 3. LOCK THE DOORS. If you all will be sleeping inside the boat, give your self some peace of mind and lock the doors at night. I was never worried about someone coming in, but I always feared that my child would pick the houseboating trip to start sleep walking! We locked the door the year I had a toddler and he slept with me on the boat. It just helped me sleep better knowing he was safe. 4. ADULTS must be with them whenever kids are on they are on the boat. This may seem redundant. Aren't you on the boat the whole time? Well, not really, many times we were docked at the shore and people were on and off the boat constantly. My mom was on the boat most of the time (cooking, relaxing, reading, etc.) so it wasn't hard to follow this one. On those couple of times we did have a child fall off the boat, there was always an adult there and scooped them up out of the water immediately. 5. COUNT. Know how many kids are with you and do a head count every so often. I found just counting the number of kids was easier than trying to find each kids individually every time I turned around. Then if I didn't come up with the right number on my count, I would name off all the kids and look for the one I couldn't see. Look how little my kids are! They're babies! 6. DOCK THE BOAT. Spend most of your houseboating time docked in a cove or protected place. Unless you're traveling from one spot to another, keep your boat in one place. It's really hard to do anything when the boat is moving or out in the middle of the lake. Swimmers are safer in smaller, more confined areas where there aren't a lot of other boats around. One of the great things about Shasta Lake is that there are so many "arms" that there are plenty of coves and secluded areas where you can park and have a more private area. 7. GAMES. Sometimes you and your kids will need a break from the sun. Bring some card games (leave Jenga behind...you know...because of the waves and boat rocking...) so the kids can come in out of the sun and still be entertained. We also brought some crafts for them to do. Decorating foam visors and drink cozies were a great way to keep them entertained and solve the problem of "whose drink is whose"
8. WATER ACTIVITIES. We could be on the most amazing trip and at least one of my kids will tell me they are bored. Rather than get mad about it, bring along some water activities to keep them busy. Squirt guns, kick boards, sand toys (a bucket and shovel can keep a kid entertained for hours), fishing poles and water floaties are all great. Kayaks and paddle boats are a great way to keep everyone entertained. If you don't have them, you can always rent them. We bought a child sized kayak (that holds up to 150 lbs) from Costco one year for about $80. My brother brought his fishing boat that also pulled water skiers and tubers. This was a big hit with kids and adults! 9. RAHSGUARDS & SUNSCREEN!! You will be in the hot, summer sun most of the time. We preferred to have the kids wear rashguard shirts so we didn't have to apply new sunscreen to at least part of their body the whole time. But even with rashguards and hats, make sure to apply sunscreen every couple hours. The kids are in and out of the water all day and the sunscreen wears of quickly. We find that while it takes longer to apply, the lotion type of sunscreen provides better coverage and lasts longer than the spray kind. But we certainly use both! 10. WATER SHOES or outdoor sandals. Flip flops are ok, but Shasta Lake has steep, rocky, red soil on the shores and having shoes that could go in and out of the water helped keep the kids feet clean and safe from cuts on rocks. Well, there's 10 ways to help make your family houseboating vacation amazing! Do you have any others to add? Leave your ideas and suggestions in the comments. 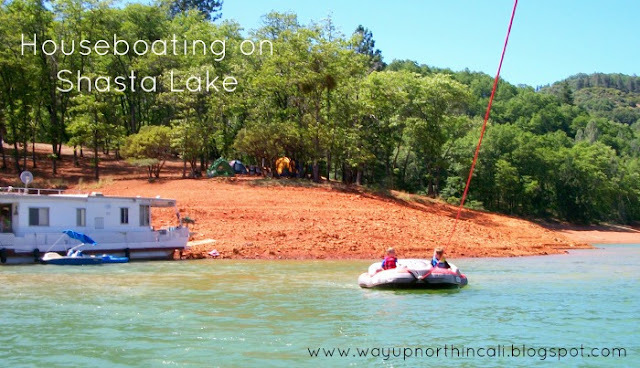 Shasta Lake is the perfect lake for houseboating. It's beautiful! I'd choose Shasta Lake over Lake Powell any day. People come from all over the country to our amazing lake every year. If you haven't taken advantage of all the incredible activities Shasta Lake has to offer, you are missing out! No kids here but saving to keep when we go boating! I've been trying for years to talk my nephew into spending a week on a houseboat. He and his wife are always worried about the kids getting bored after a couple days. I'll be sure to pass along your suggestions to them. Thank you! Hopefully these tips will help give them some peace of mind and some ideas for keeping them busy! This looks like a lot of fun. You have shared some great tips for boating with kids. Safety is important even while having fun. I would love to visit Northern California someday. I have been to San Francisco, but that was the furthest I got. We love San Francisco, but my heart lies way up north. It's beautiful up here, I hope you make it up to Nor Cal someday. Great tips and yes, safety is indeed important! Thanks for sharing your fun and adventure with the kids!